Maya Civilization is said to be one of the old Mesoamerican civilizations originated from the areas around present Mexico in North America. The Mayan people who lived around yucatan area showed their outstanding skills on art, architecture, astronomy, writing, calendar, building various pyramids and mathematical calculations. Though the civilization was established around 2000 BC, it found great development between the classic period of 250 AD and 900 AD. The Maya civilization had its influence with other mesoamerican civilizations originated from Honduras, Guatemala and Salvador as some of their features like calendar, writing and epigraphy shared with those neighbouring mesoamerican civilizations. However, the Mayan culture declined after the Spanish invasion on their territory around 16th century. 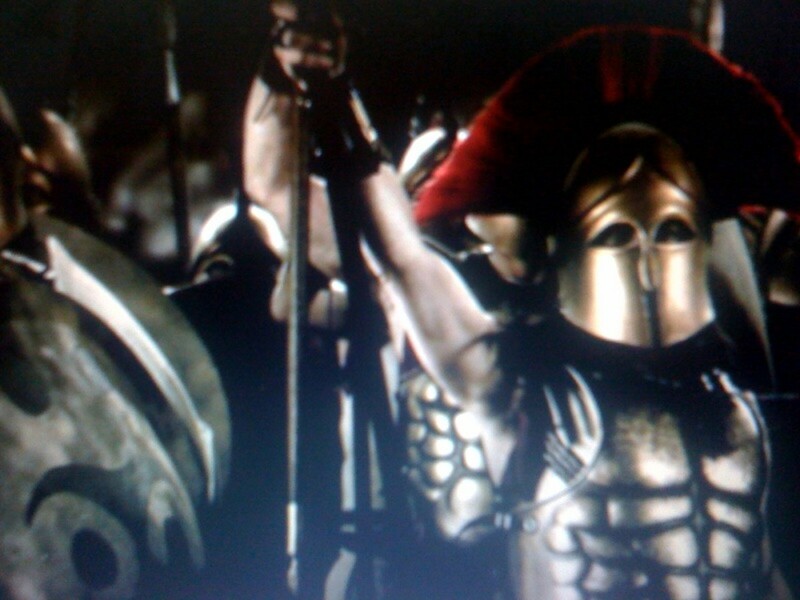 We could learn something about this great civilization from the remainings found. The Maya civilization is divided into five different time periods such as The Preclassic Period, The Classic Period, The Collapse of Maya Civilization, The Postclassic Period and The Colonial Period. The Maya civilization had both growth and decline in different periods of time. The preclassic period of Mayans is between 2000 BC and 250 AD.The Mayans had been living during this period in Eastern and Southern Mexico and central parts of America. They were farmers living in small villages and huts. They cultivated crops like maize, beans, peppers and fruits including pineapple, papaya and avocados. The housewives ground cultivated maize with the help of specially designed grinding stones. The ground maize was mixed with water to make the drink called atole and they also cooked flate cakes from ground maize. 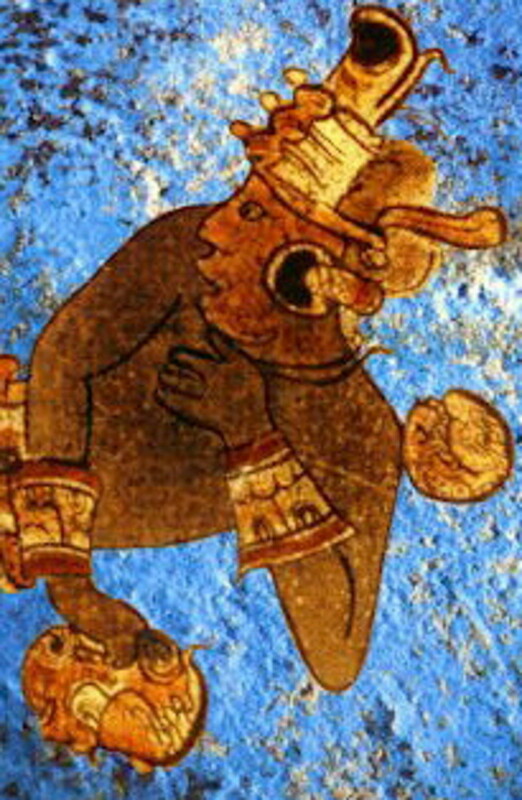 During this period, the Mayans showed great interest on fishing and hunting animals like rabbit, deer and turkeys. Besides hunting and fishing Mayan men were involved in other works like making stone tools, clay figurines, jade carvings, ropes, baskets, and mats. The women showed their talent on painting pottery vessels and weaving cloths out of cotton. The Mayans had known the technique of manufacturing paper from the bark of wild fig tree which they used in functions. They worshiped Rain as their favorite God. The Mayan people began to show their skills on different fields like art, architecture, agriculture and astronomy only during the classic period of 250 AD to 900 AD. The population of Mayan reached peak in various regions by this time. The southern lowlands found great developments with arising of many cities including Tikal, Palenque, Copán and Calakmul. In many places Mayans constructed giant pyramids. The other important feature of this period is stelae, a pillar like craved stones which depict the history and achievement of Mayan rulers. In this period, they began to observe the movement of solar bodies and made astronomical calculations precisely to create their own calendar called Mayan Calendar. 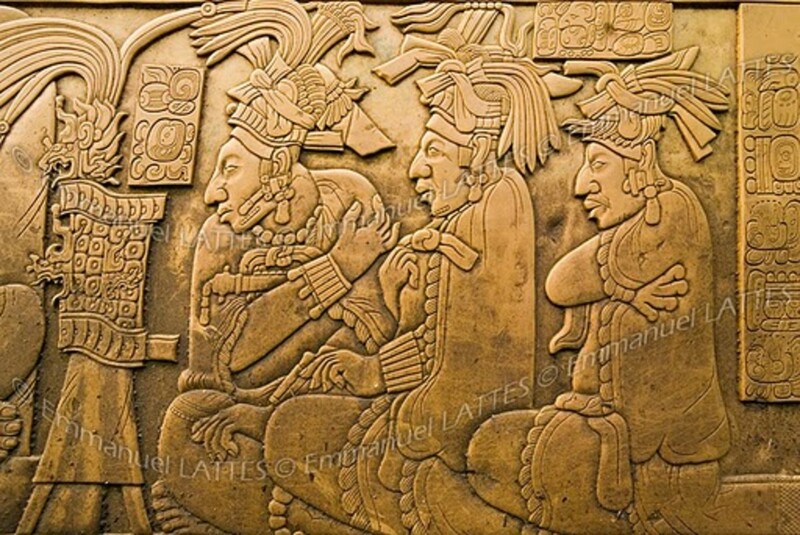 It has been recorded in history that Mayan civilization in southern lowlands came to an end between 800 AD and 900 AD. There are many theories to explain about the decline of Maya civilization during that period. Non ecological theory tells that the decline could have happened due to increased population and foreign invasion and whereas ecological theory tells that the decline of the civilization could have happened due to epidermic diseases, environmental disaster and severe climatic changes. 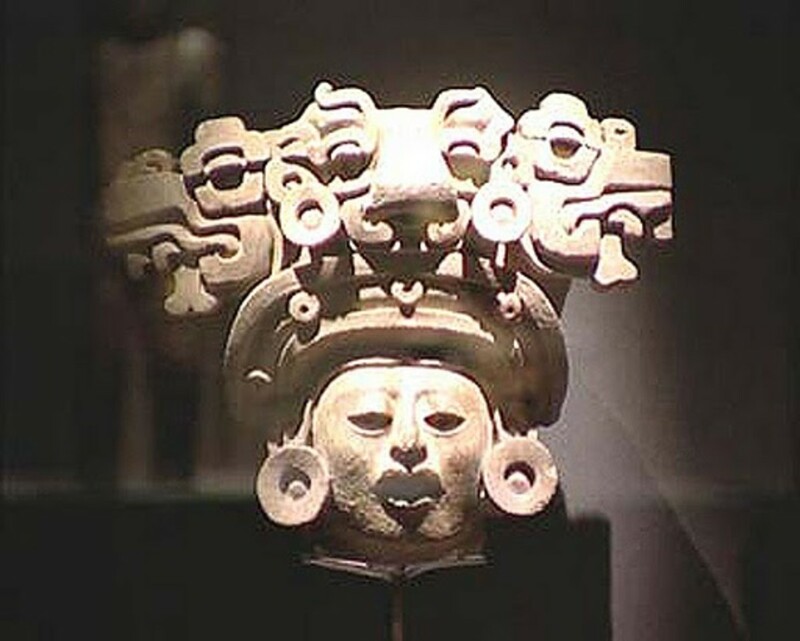 The other theory is explaining that severe drought could have been the reason for the decline of the Mayan civilization. 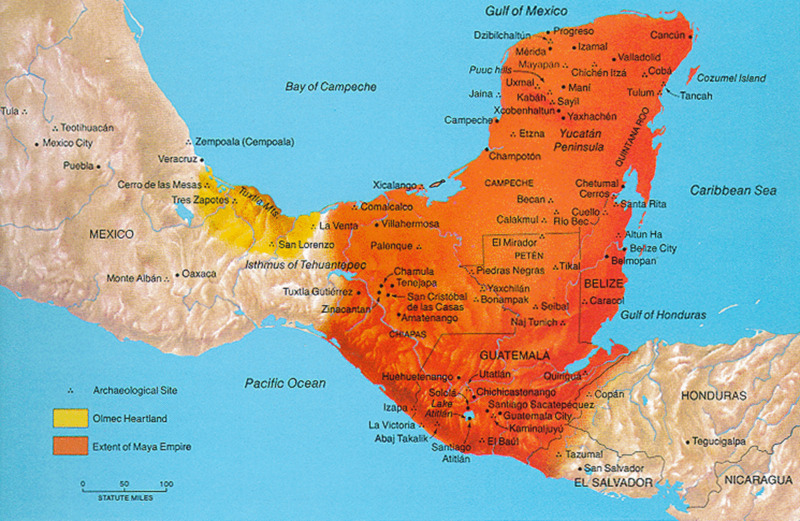 During the period of 900 AD to 1000 AD, the Maya civilization had its great developments in northern lowlands. Chichen Itza, Uxmal, Edzná, and Coba were some of sites arouse along Yucatán region. After the decline of the dynasties like Uxmal and Chichen, the Mayan named Mayapan ruled all the parts of Yucatan until 1450 AD. The Spanish invaders occupied Yucatan area of Mayan's territory around 16th century. It took more than 150 years for the Spanish invaders to bring all the Maya regions under their control. Most of the Spanish invasions were on the purpose of seizing precious metal resources like gold and silver in various parts Maya region. It is thought that Maya should have to be the first pretelescopic civilization and it is stunning fact that those people had great interest on exploring different constellations in the sky. 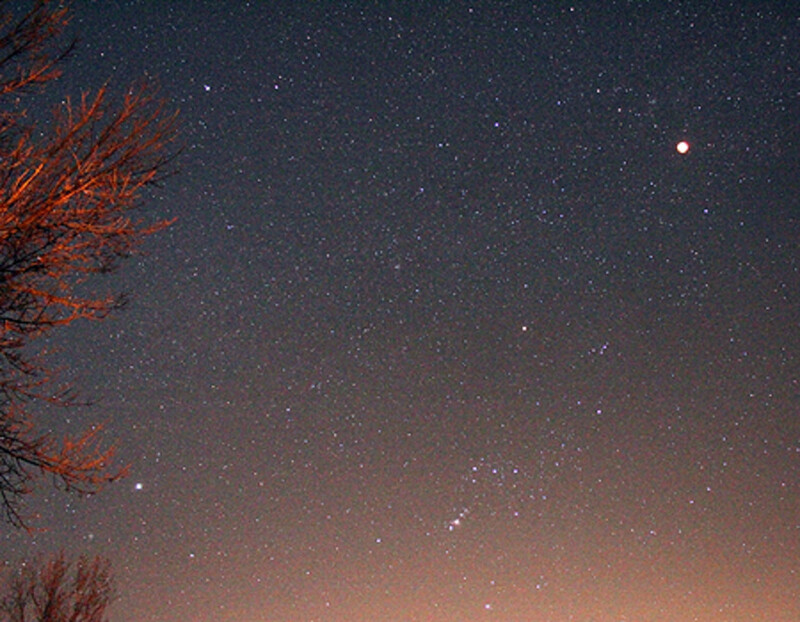 The Mayan people are first ones in the world to have discovered the Orion Nebula. They also had special interest on observing the movement of sun, earth and other planets. They had noted the days when sun directly passes overhead. Mayan arts are considered as one of the most beautiful and sophisticated things of the world.The Classic period of Maya civilization gave rise to many wonderful pieces of Maya arts. Each art is helpful to know about their life style and culture. The humid climate prevailing on Central America naturally save some wonderful arts like Maya Blue, El Tajín Cacaxtla and Bonampak. These arts are depicting the scenes of victories, myths and different achievements in the history of Mayan people. The Haab or civil calendar of Maya had 18 months and each month contained 20 days. The remaining five days of each year were believed as unlucky ones. 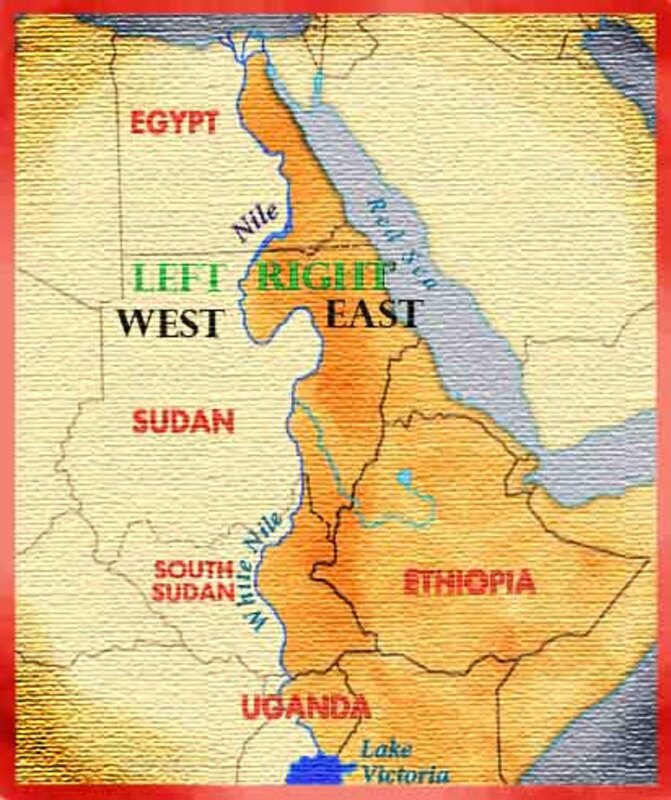 Pop (mat), Wo (black conjunction), Sip (red conjunction), (Sotz') bat, Sek, Xul (dog), Yaxk'in (new sun) , Mol (water), Ch'en (black storm), Yax (green storm), Sak (white storm), Keh (red storm), Mak (enclosed), K'ank'in (yellow sun), Muwan (owl), Pax (planting time), K'ayab' (turtle), Kumk'u (granary), Wayeb (five unlucky days) are 18 months of Mayan calendar and the last Wayeb contained five unlucky days. The days of each month was represented by numbers followed by the name of the month and for instance the first day of Pop month is noted as 0 Pop and the last one is 19 Pop. 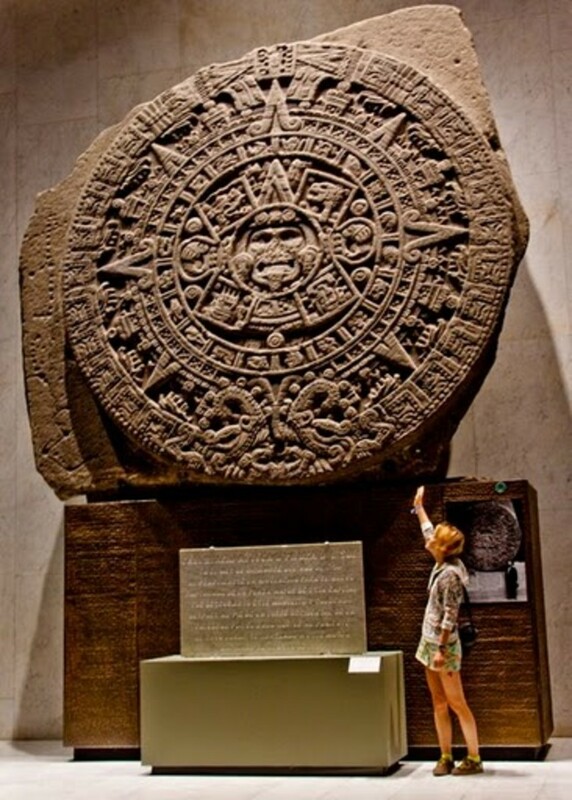 These days Mayan calendar has been the hot topic throughout the world. It is thought by many people that the world would meet death end on December 21, 2012 as there are no more days in Mayan calendar after that particular day. But, some people are saying that the sun will rise in constellation aquarius after that particular day as the beginning of a new age. So, it is believed that our great earth would be safe even after December 12, 2012. It is true that we are only holding the responsibility to save our home planet by controlling ever increasing global warming. They built many amazing pyramids and temples during the classic period of civilization. Most of the temples and pyramids are provided with roof comb and colorful paintings. 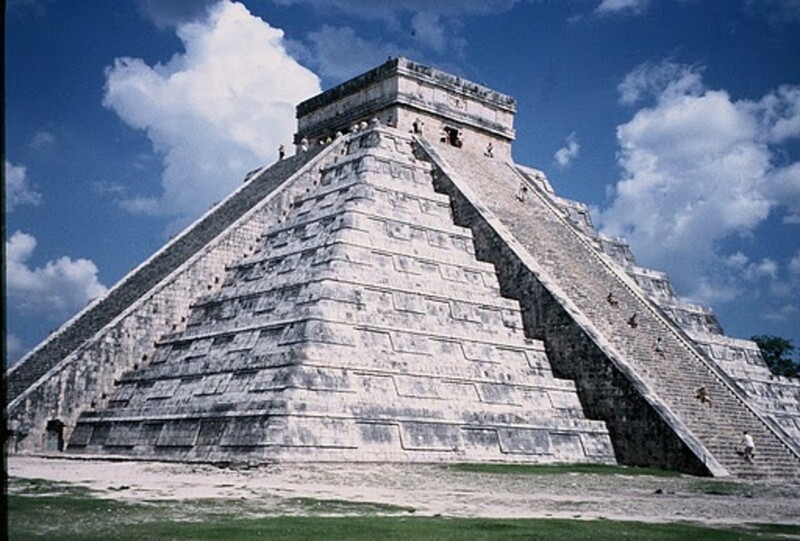 The most important pyramid is lying at Chichen Itza, Mexico which was built around the year 1050 AD. The pyramid has four stairways on each side, and each stairway is provided with 91 steps and a platform. The total number of steps on four sides including platform reveal the total number of days in a year (365 days). The pyramid has nine terraces on each side and centrally lying stairway divides them into eighteen parts which reveals total number of 18 months in Mayan Calendar. The Mayans showed their great skill on sculptures also. They preferred different materials like wood, stone and jade for their sculptural works. The most common form of their sculpture is called as stela which was nothing but a craved pillar like stones and stone slabs. 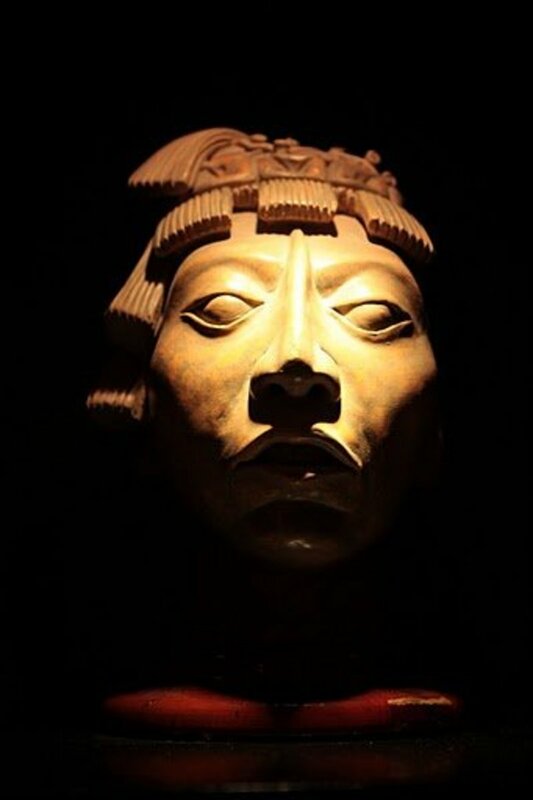 Each sculptural work of Mayans depict the rulers of sites and history of important Maya sites with hieroglyphic texts. Only a very few wooden sculptural works of Maya remained at present time which can be seen at temples of Tikal site. It is incredibly true that Mayans were also able to make ornaments, jades from naturally available color stones. Though they did not have metal tools in their period, it is amazing that they had shown great interest on jades. 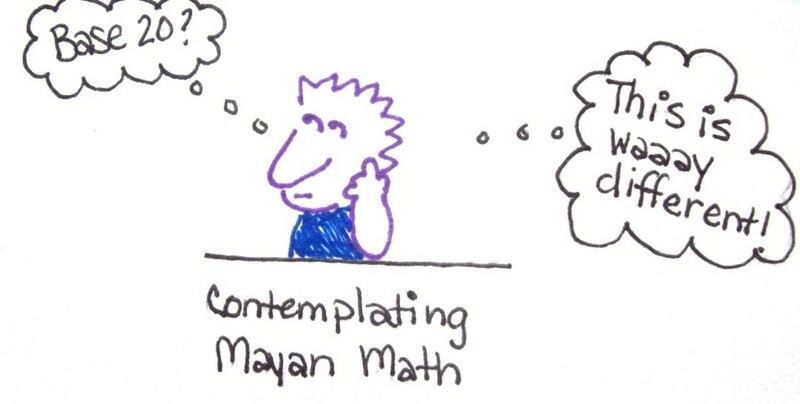 The Mayans had great knowledge in numbers and even in the preclassic period zero had been in the use. 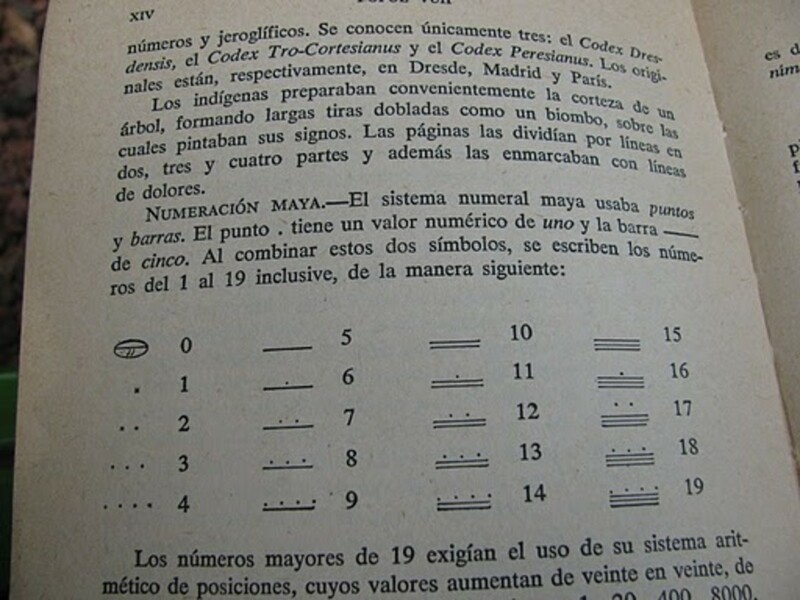 They had been using only three symbols for representing all the numbers. Shell shape was used to represent zero and a single dot to note one and double dot for reprsenting two. The horizontally put four number of dots represent number four. Number five is noted by a bar. We can get all the numbers up to 19 and the number 19 is noted by four dots in horizontal row and the dots lying on the three horizontal lines stacked up to each other. The numbers above 19 are vertically represnted in powers of 20. Check out my articles for more on this and my sci fi story on the Dark star. This subject is very popular at the moment. No one knows the truth. Check out some of my hubs for more on this and my story of the Communicator. Dear JohnBarret, Thank you very much for coming here and adding your nice comments. WoW, I was looking for Maya and you made my day. Thanks dear. Dear Friends maheshpatwal and JoinJax, Thank you both for visiting this Hub and leaving your nice comments. And dear JoinJax, Thanks again for your additional information on Mayan pyramids! You description of the Pyramid of KulKulKan was very interesting. Did you know, the Maya were proficient in the use of acoustics? I bring this up here, because most people don't know of the unique "echo" one can produce while positioned on a perpendicular line, some thirty to fifty yards from, and centered on those same steps. Think doppler. Think 91 steps, each slightly farther than the one below. It really is something to hear. Dear Money Glitch, Thank you very much for your appreciation and leaving your nice comments. It is true that we never need to worry about the end of Mayan Calendar. Dear hafeezrm, Thank you very much for coming here and putting your valuable comments. Nice hub, bundle of info on Maya Civilization. I went to Mexico long time back but still remember Teotihuacan and Palenque archaeological sites. The latter was surrounded by rainforests and was quite a mystry. Dear thevoice, Thanks a lot for visiting this Hub and leaving your nice comment.